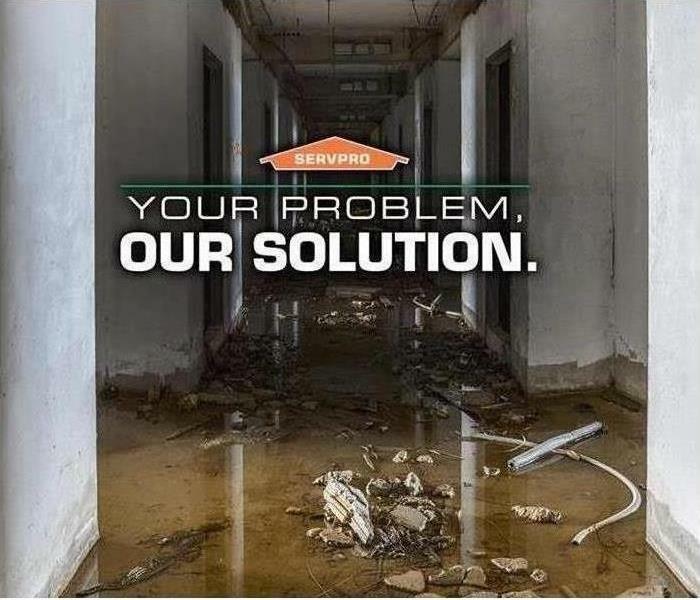 At SERVPRO of Madison North & East, we are proud to have a wonderful group of employees that share our vision of providing 24-hour emergency service and are dedicated to being faster to any size disaster. 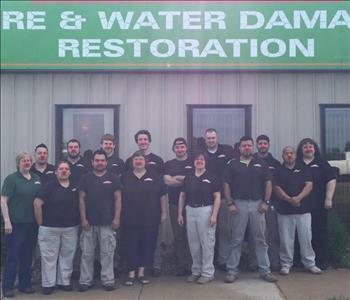 Our SERVPRO of Madison Family put on our red noses to help support awareness of Children's Poverty. National Red Nose Day is a mission to help kids who need us most. 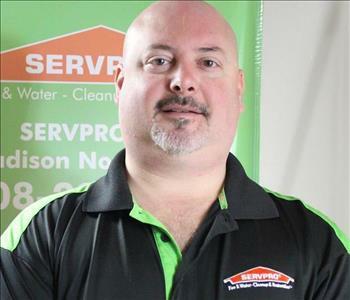 Ray started working at SERVPRO in 2001 as a technician and today he is a Project Manager. Along with Ray's many years of experience, he is certified in the following: WRT-IICRC, ASD-IICRC, Certified Mold Remediator-PMII, Lead-Safe Renovator, OSHA Safety & Health, Effective Air Washing & Air Scrubbing, Successful Subrogation I for Restoration Contractors and DryBook. 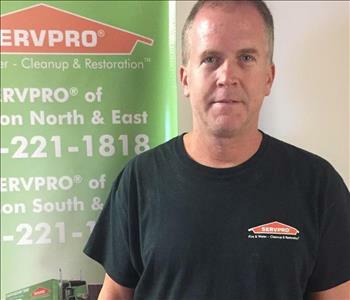 Ray's favorite part of working at SERVPRO of Madison is when he is helping others when they are in need. 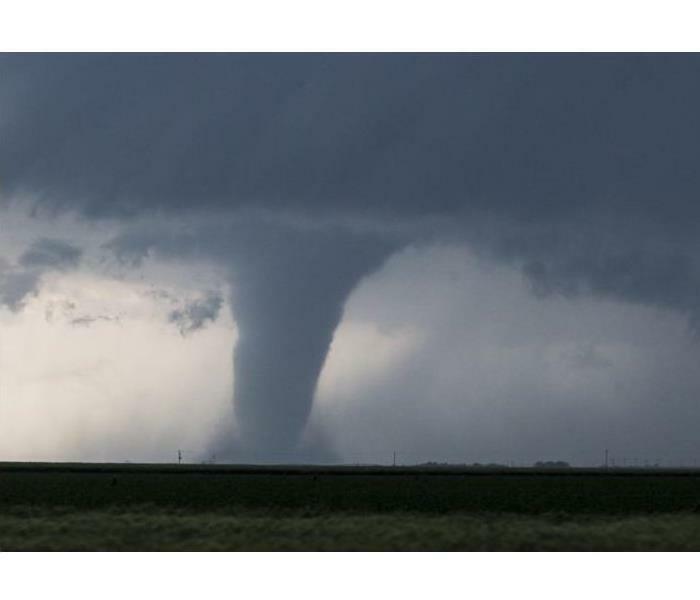 When not at work, Ray enjoys spending time with his family, outdoors and photography. Jackie started with SERVPRO in 2012 as a technician and today she is a Production Manager. Along with Jackie's years of experience, she is certified the following areas: WRT-IICRC, FSRT-IICRC, Lead-Safe Renovator, Successful Subrogation I for Restoration Contractors and DryBook. Jackie's favorite part of working at SERVPRO of Madison is the appreciation and gratitude she receives from customers after she has completed the job. In her free time, Jackie enjoys decorating, landscaping and shopping at antique malls. Pam has worked at SERVPRO as a Project Manager since 2010. Pam's certifications include ASD-IICRC, WRT-IICRC,FSRT-IICRC, Certified Mold Tech II Professional, Lead-Safe Renovator, RSA Trauma Scene Cleanup, OSHA Safety & Health, Effective Air Washing & Air Scrubbing and Successful Subrogation I for Restoration Contractors. When asked what she likes the best about her job, Pam responds "Taking a job from start to finish then seeing the customers happy face when it is completed. "Like it never even happened." Pam always tries to treat each job whether large or small very important like how she would feel if this was her house. Kevin started working for SERVPRO in 2014 as a Project Manager/Estimator. He is FSRT-IICRC and WRT-IICRC certified. Kevin's favorite part of working at SERVPRO is the wide variety of work to be done. He appreciates the variety everyday. In Kevin's free time, he enjoys watching his 2 sons participate in their sporting events. He also enjoys to going fishing when he is able to. Chad started working at SERVPRO of Madison North & East on January 15th 2018 as a Production Manager. He has 12 years of experience in the restoration field and is certified in Water and Lead Safe Renovator. When asked what he likes the most about working at SERVPRO, Chad said "I like having a voice. My boss listens to my ideas and the whole team works together to make them happen. We all support each other and work together to offer the best possible service to our customers." Tim started working at SERVPRO as a temp in June of 2010. In 2011 he was hired as a full time Technician. Tim's favorite part of his job is the variety of work offered. In Tim's free time he enjoys watching old science fiction movies. Carlos started with SERVPRO as a temporary employee and became full time in February 2016. When asked what he likes best about his job, Carlos responds "Hearing that the customers are happy with the work that I did for them and visiting different places in Wisconsin". In his free time Carlos enjoys spending time with his family, going fishing and having bonfires. Katie started working with SERVPRO in May of 2016 as a Technician. Just like her brother Trevor, Katie is no stranger to SERVPRO because they have been around this business since they very young. When asked about what she enjoys the most about working at SERVPRO, Katie responded "I enjoy working with my co workers and helping people when they are in need". When not working or attending school at UW LaCrosse, Katie enjoys spending time with her friends and family and hiking the bluffs in LaCrosse. In June of 2012 Derrick began working at SERVPRO as a Technician. Derrick is only able to work during the summer months and on holiday break because he attends UW Green Bay during the school year. When asked what is his favorite part of working at SERVPRO, he said "I enjoy working in different environments". During Derrick's free time, he enjoys fishing and spending time outside. Trevor started working at SERVPRO in June 2017 as a Technician but has grown up in the SERVPRO family since birth. Trevor's favorite part of his job is working with great people. In Trevor's free time he enjoys hunting with his dad (Jason Wilkinson), sports and trap shooting. In 2015 Tammy began working at SERVPRO of Madison North & East as a marketer. 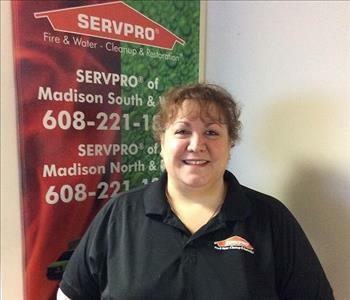 Although she has been an employee for 4 years, SERVPRO of Madison North & East entered her life 20 years when her husband Jason Wilkinson (owner of SERVPRO of Madison North & East) began working here. Tammy's favorite part of her job is meeting new people and being a part of a company that she is proud of. In her spare time Tammy enjoys spending time with her family and 3 dogs, going to the Farmers Market and watching a good movie on Netflix. Al started working at SERVPRO in November of 2016 as a Marketer. When asked what is his favorite part about working at SERVPRO of Madison, he answers "Everything!" with a big smile on his face. In Al's free time he enjoys spending time with his family (especially his grandchildren), gardening and biking with his wife Mary and going for walks. Kathy joined SERVPRO's marketing team in August of 2015. Her favorite part of working at SERVPRO of Madison is helping the community and meeting new people. In her free time, Kathy enjoys spending time with her family, friends and walking her dogs. Allen (Al) started working at SERVPRO of Madison North & East in August of 2017 as a Project Manager. Al has several years of experience and has the following certifications: Water Removal Technician, Mold and Lead Safe Removal. 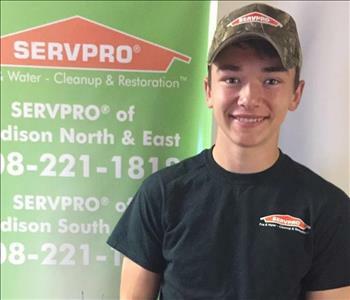 When asked what he enjoys about working for SERVPRO of Madison North & East, he said "I like the variety of work along with the feeling of accomplishment when you are helping a customer through a difficult time." Al's hobbies include boating, golf and spending time with his family. Nancy started working at SERVPRO of Madison in January 2016 as an office assistant/accounts receivable. Nancy's favorite part of her job is getting to work with a wide variety of people both within the company and with customers. Nancy loves working in customer service because she enjoys talking to and helping people, especially when they are in need. Nancy enjoys traveling with her husband on their Harley motorcycle, spending time with her family, especially her two grandsons, gardening and scrapbooking. 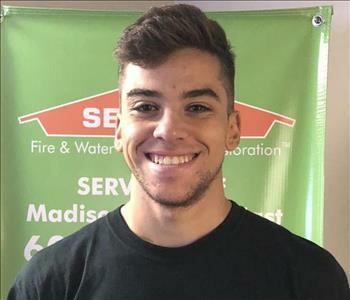 Michael started working for SERVPRO of Madison on September 5, 2018 as a technician. When asked what are his favorite parts of the job, he said "Everyone is very friendly and I enjoy helping people." During his free time, Michael enjoys watching Netflix and taking naps. 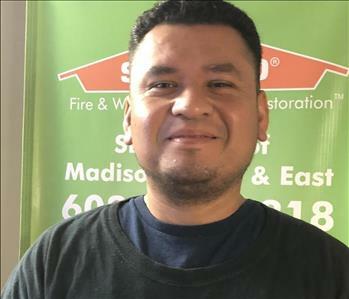 Edgar started working for SERVPRO of Madison o August 24th 2018 as a Technician. 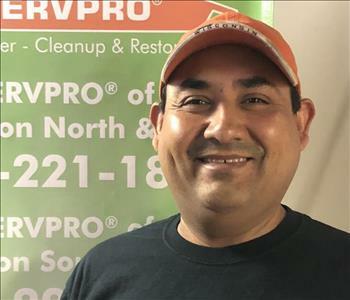 When asked what does he enjoy about working at SERVPRO, Edgar responded "Working all year." In his spare time, Edgar enjoys playing with his children, reading the bible and going to church. 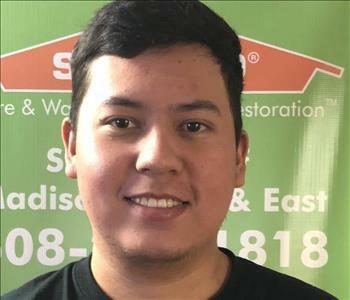 Jose started working at SERVPRO of Madison North & East on August 27th, 2018 as a Technician. When asked what he likes about working at SERVPRO of Madison North & East he said "I like that I am able to get plenty of hours". In his spare time, Jose enjoys participating in sports. Jorge started with SERVPRO of Madison North & East on August 14th, 2018 as a Technician. 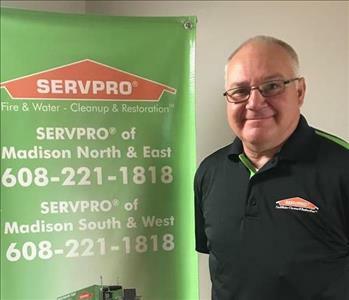 When Asked what he likes about working for SERVPRO of Madison North & East, he said "I like that it is a very stable company with consistent work". On his spare time, Jorge enjoys reading the Bible and going to church. 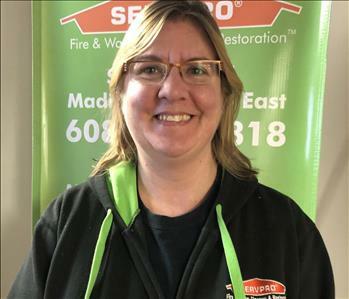 Sheila started working for SERVPRO of Madison North & East in April of 2018 as part of the cleaning crewand recently was promoted to crew chief. Sheila’s favorite part of working at SERVPRO of Madison North & East is the feeling of being a part of a family with her co-workers. In Sheila’s free time, she enjoys going camping and riding the motorcycle with her husband. 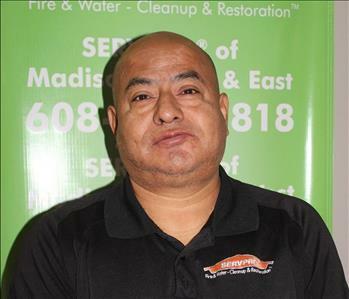 Rafael started working for SERVPRO of Madison North & East in December of 1999 as part of the crew. When asked what his favorite part about working at SERVPRO, his response was "I like all parts of my job!" Outside of work, Rafael enjoys working on his home with cleaning and organizing.